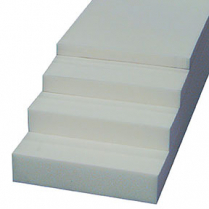 Foam must be purchased based on geographical region. For example, if your business is in BC, then you can only order BC foam. There are four geographical regions: Alberta/Saskatchewan, British Columbia, USA and all Canadian provinces from Manitoba to the East. You can find out which geographical region the foam is by its name; you can also search for foam by geographic area. Blue Foam Firm 1" X 22" X 80"